And to make these even more dangerous and addictive I drizzled on a little melted peanut butter onto a few of them. Guess which ones went first? Again this is optional but highly recommended. I don’t claim these to be skinny muffins, like I said before these come in at around 210 calories. Your average muffin tends to be around the 300 to 350 mark. I just swapped in a few alternatives to make them a little less calorific. The applesauce really replaces most of the fat in this recipe but I did find I needed to add a little oil still. As without it they were just wrong! They tasted a bit…. wrong! You could try using coconut oil if you wanted to try something a little healthier. I haven’t tried it but if I was to I would use the oil in it’s liquid state. 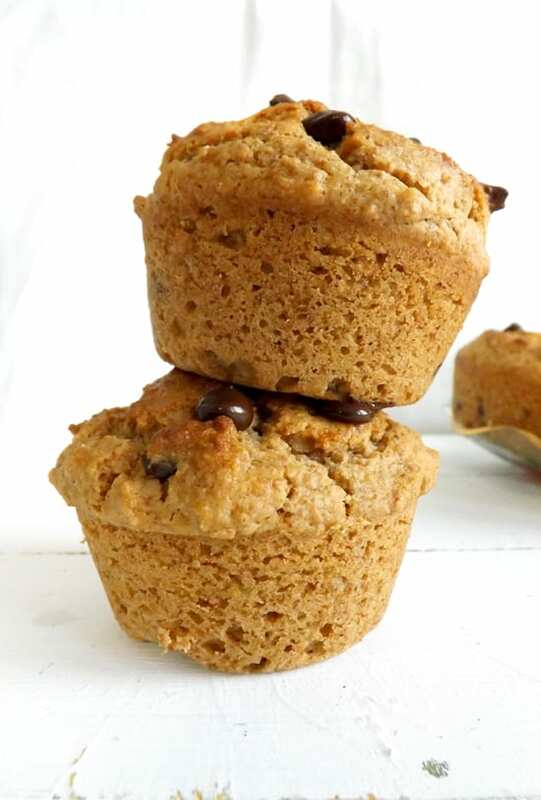 Give these a go they are fabulous and these are definitely my new favourite muffin and I am sure they will be yours too! 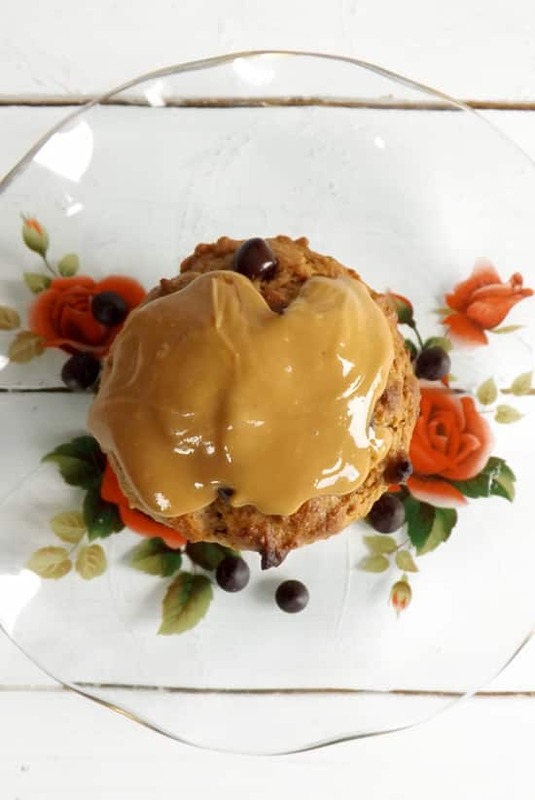 A muffin packed with fibre rich whole wheat flour and kept moist by unsweetened applesauce and virtually fat free buttermilk. Lightly grease or line with cases your muffin pan. Pre heat your oven to 220C / 425F / Gas mark 7. In a medium sized mixing bowl mix the flour, baking powder, baking soda, salt and chocolate chips together until well mixed and place to one side. In another medium sized bowl or large jug put the egg, both sugars, vegetable oil and buttermilk in together and whisk until everything is well combined. Once well combined add in the vanilla, applesauce and peanut butter and whisk again until you have a smooth liquid. Spoon the batter into your prepared muffin pan. Fill them up to the top, you will get between 10-12 muffins out of this batter. Pop them in the oven after 5 minutes you need to turn the oven down to 190C / 375F / Gas mark 5. The initial hot temperature will help them to rise then the lower one will bake them throughout without burning them. Once the time is up check them with a skewer to see if they are fully baked (it should come out clean) if they are take them out of the oven but leave them in their tray for 5 minutes. 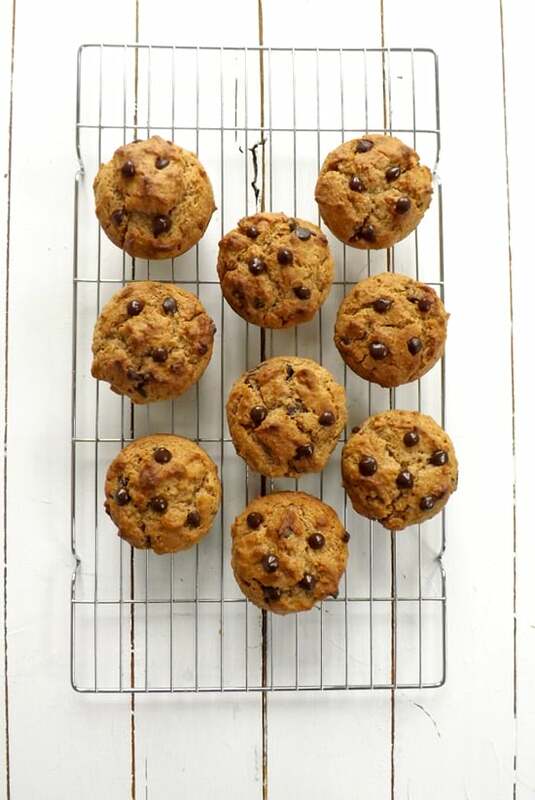 After 5 minutes take them out of the muffin pan and place them onto a cooling rack, if you like to eat them warm just give them 10 minutes to cool enough for handling. If you are going to store them allow them to fully cool down. All muffins are best eaten on the day of baking but they will keep in an airtight tin for 4 days and they freeze well too for up to 3 months. Mmm! I bet these taste awesome! There’s just something about the combination of peanut butter and chocolate that makes me swoon! 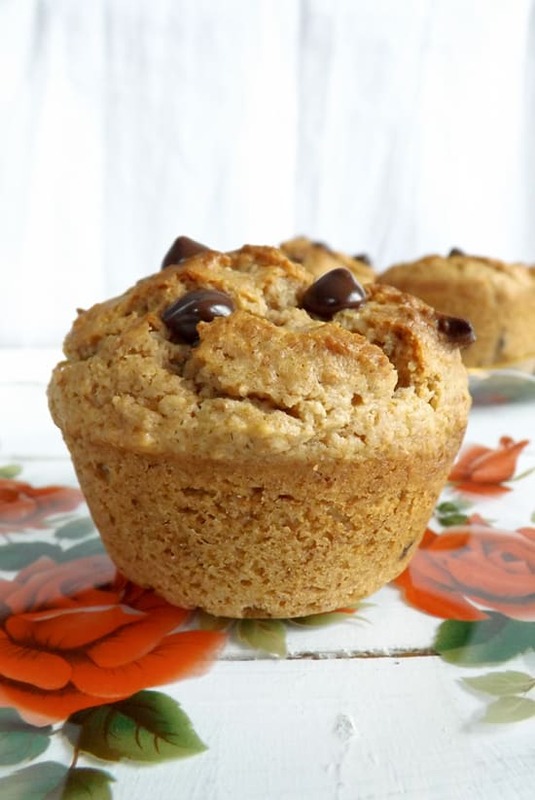 I loved the idea of using applesauce and buttermilk to make a lighter muffin! I will definitely be trying these out! Your muffins look so good! especially the ones with the choc chips and peanut butter….I’m not a very healthy person! :) I’ve never tried using applesauce in my cakes, it seems like such a strange replacement haha- can you actually taste the apple? Hi Von the applesauce is really mild it keeps baked goods really soft and moist you can barely taste it it just helps keep the sugar content down! I’m not very healthy either! I really like this recipe, they look beautiful. 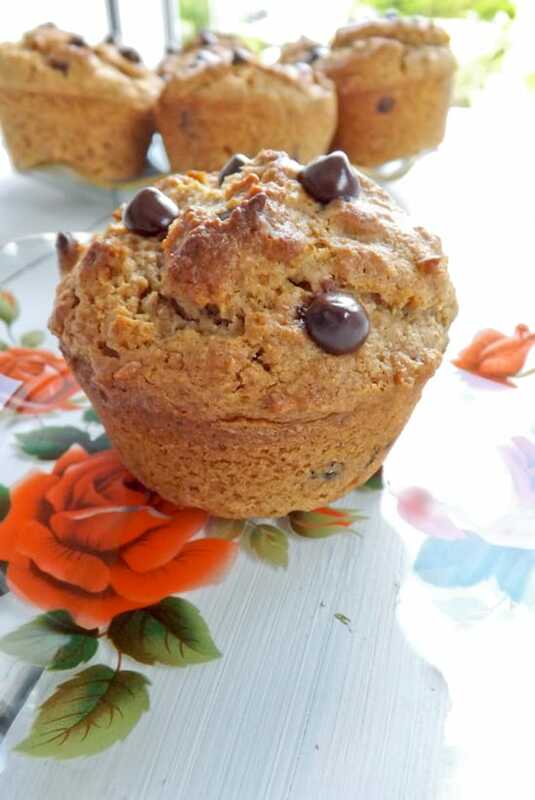 Love that they are sweetened with apple sauce, some of my favourite muffins are sweetened that way and they are so much nicer (More moist, as much as as i dislike that word). Can’t wait to try these. On the “to make” list they go! There’s nothing better than a recipe that is both healthy and tasty! Especially when peanut butter and chocolate are involved…an unbeatable combo! hahaha oh gosh I loveeeee peanut butter!! I’m always looking for ways to incorporate it into recipes!! 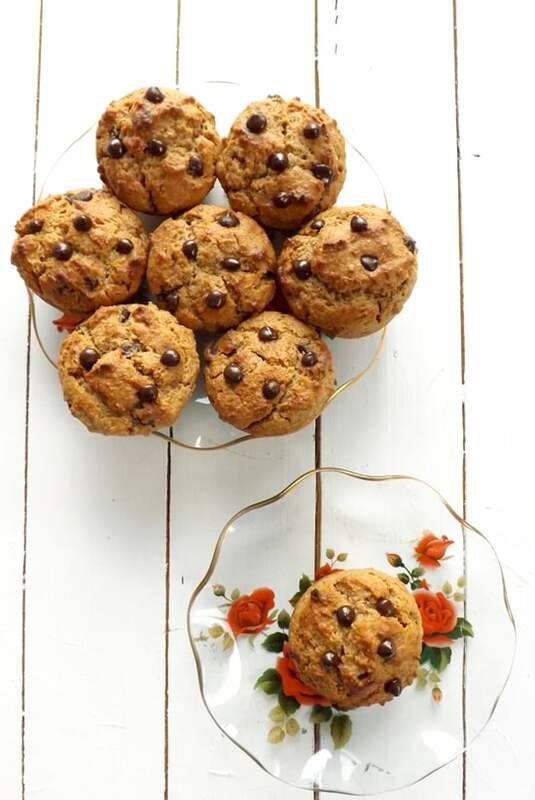 These look delicious – especially with the chocolate chips! You’d never guess these beauties were lower in calories! They look divine! We are crazy for peanut butter! 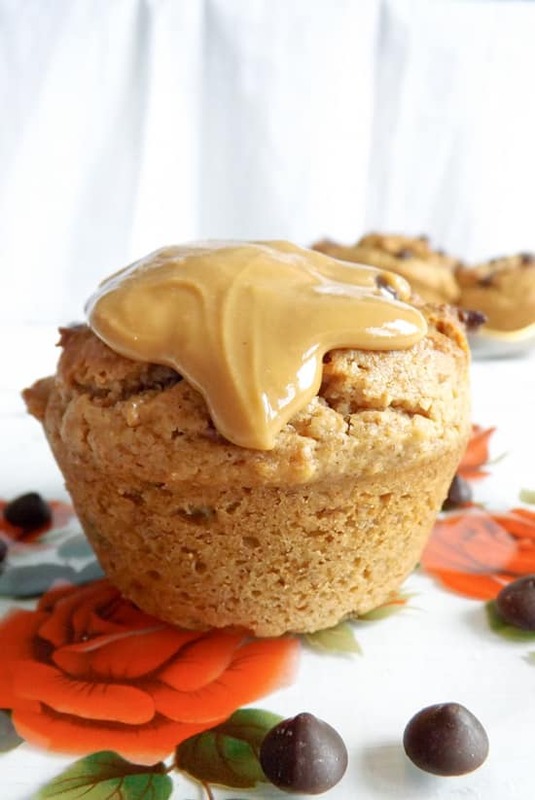 My husband would complain if I didn’t spread some peanut butter on his morning bread with bananas…These healthyish muffins look awesome, Emma. Hi Angie thank you, I am totally with your husband banana and peanut butter are amazing together! I like to think of these yummies as healthy-esque 🙂 They look ALL the deliciousness. 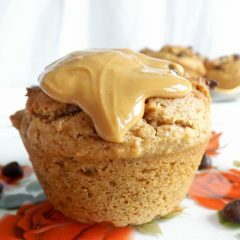 I have never eaten a peanut butter muffin but these look amazing. I want one for breakfast right now. Hi Kelly thank you I can’t help it I have always loved peanut butter I will eat it with anything!